It was already clear in 1941 that World War II had developed into a major catastrophe. Heading the list of casualties were hundreds of Jewish communities each testifying to a tragedy of nightmare proportions. With the demise of Kehilla life all over Europe came the virtual extinction of all organised Torah learning. All the great centres of learning were gone, almost nothing remained; and the seeds of Torah which would be planted in Americaand Eretz Yisroel by the few surviving Gedolim had yet to emerge. Torah was in danger – how was Klal Yisroel to live up to its sacred and historic task and rebuild what had been so ruthlessly destroyed? England was fighting for survival. The country was transfixed with thoughts of the murderous Amolek invading their green and pleasant land. Enduring wartime scarcities and a worry filled daily routine, lonely wives and children tried anxiously to glean crumbs of comfort from the gloomy news. One thanked G-d for each day that one could still live in the safety of ones home. Ribono Shel Olam let us survive, let there be a Klal Yisroel left to glorify your Name! – Not the most appropriate moment to announce the setting up of an exciting new Educational Establishment! But then, Reb Dovid Dryan zt"l was no ordinary person. Think of a Yid, warm and smiling, noble of bearing, yet completely humble and self-effacing, and you see Reb Dovid Dryan. Enriched by his years with the Chofetz Chaim, radiating Ahavas Yisroel and Dveikus Bashem, above all he was possessed with a fierce and unquenchable love for Torah. He was the archetype Yid, - you could have transplanted him anywhere in the world and he would have been just the same. It was Gateshead’s great fortune and Z’chus that he was here and, completely impervious and oblivious to such trivial considerations such as financial climate, difficult wartime conditions and the indifference of the general population, he, the complete Oved Hashem, only thought of building Torah and spreading Torah. It was he, who in 1929 was the moving spirit to set up Gateshead Yeshiva, who nursed it, tended it and cared for it as a father to a child for so many years. And it was Reb Dovid Dryan in 1941, whose Torah permeated soul conceived the idea – wild impractical and heroic – of setting up a Kolel inGateshead. In September 1941 (Elul 5740) he sent letters to 20 prominent Rabbonim in England inviting them to join him in making his latest dream a reality. Nowadays, we understand that Klal Yisroel require men of stature, men of extensive knowledge of Torah to be their leaders. It is also understood that such extensive knowledge is not gained simply by spending a few years in Yeshivo, and facilities are required to enable promising Talmidei Chachomim to develop and flourish after their marriage by being helped to devote themselves fully to progress in their continued learning. That has always been understood by Klal Yisroel generally, and provisions were always made to facilitate the development of potential Gedolim. But it was not so easily understood in England in 1941. It was wartime. Be happy if you can survive! Even to send a son to Yeshiva for two years almost put you beyond the pale and was considered irresponsible by many – but then to compound the irresponsibility by seriously suggesting that a promising scholar should continue full-time learning beyond marriage must have sounded like something from a different planet. In this spirit of incredulity and in an atmosphere of smoke filled tension and security, Reb Dovid Dryan wrote his letters. Hashem Yisborach created His world in an interesting way, we have to look at it and take notice! An oak tree produces thousands of acorns. Many of them are eaten by squirrels, even more just rot on sterile ground, but if just one takes root in a patch of fertile ground then another mighty oak from tiny acorn grows. The thousands that perished were not wasted, for only one needs to bear fruit. Reb Dovid sent out twenty letters. Nineteen fell without taking root. Kolel? At this time? Who needs it? – Impossible, who can think of such things, does he now know that it’s 1941! The twentieth one fell on fertile soil, and was opened by Rabbi Eliyahu Eliezer Dessler zt"l.
At that time Rabbi Dessler was 50 years old and had been in England fourteen years. He had been the Rav of Montague Road Synagogue in North London, but at the outbreak of war, when most of his community was evacuated from London for reasons of safety, he relinquished this position. He himself moved to Chesham, some thirty miles from the capital, and continued giving Shiurim to Talmidim in surrounding towns as well as inManchester, an arduous exercise under normal circumstances, further compounded by the stringencies of wartime. In order to understand how Rabbi Dessler reacted to Reb Dovid’s letter, we have to know something more about Rabbi Dessler. He was born into a family eminent Talmidei Chachomim. His father Reb Reuven Dov Dessler and his uncle Reb Gedalyohu were both ardent Talmidim of Reb Simche Zissel Ziv, and in fact the family were the greatest single supporters of the famous ‘Talmud Torah’ of Kelm. His uncle Reb Chaim Ozer Grodzenski described him as a child prodigy and, at the tender age of twelve, he joined the Kelm Talmud Torah, where apart from the years of the First World War, he remained for eighteen years. His extraordinary diligence was legendary and from his Rebbe, Reb Ziv Hirsch Broide, his father-in-law, Reb Nochum Zev Ziv, and from his own father, Zecher Tzadikkim L'Brocho, he absorbed those qualities on which his unique greatness was so firmly established. It must be assumed that in his role as communal Rabbi in London, and the Rebbe to groups of Talmidim, his vast knowledge and potential had not yet been given full expression – as if Heaven was placing him on hold – until that providential letter arrived, that was destined to open up a new world for Rabbi Dessler and for England. The letter was a catalyst that brought together a man of giant ideas and ambitions and a giant man capable of implementing those ideals. The irony is that Rabbi Dessler thought and spoke of himself in the most humble manner imaginable (when the Kolel was established he wrote to a friend in America of the great merit he felt in being able to “lie at the dust” of the Chavrei Hakolel, not as their Rav but as their Shammes), and thought that his only dispensation to take up the challenge presented by Reb Dovid was BeMokom she Ein Ish Hishtodel L'yos Ish. In spite of his monumental modesty, of the misgivings he had of his own merits, Rabbi Dessler delivered a response that both took grasp of the critical nature of the times and the historical necessity to act and build Torah in an era of destruction. With warmth and enthusiasm he urged Reb Dovid not to delay the implementation of his idea “not for a moment and all the more not for hours or days” but at the same time urged caution to ensure that Kolel was established with the greatest thought and care, so that the purity of its conception would be manifested in its implementation. He ended his response by expressing his willingness to come to Gateshead. Rabbi Dessler came to Gateshead and things began to move. October 10th 1941 was a historical day, and it was at 175 Whitehall Road, the home of the late Gateshead Rav zt"l that the very first meeting in the process of establishing the Kolel took place. Those present on that auspicious day were Rabbi Naftoli Shakovitzky, The Rav of Gateshead, Rabbi Chaim Shmuel Lopian zt"l (in whose house at 22 Claremont Place the Kolel would actually begin), Reb Dovid Dryan, the Gateshead Shochet and master architect, Rabbi Eliyahu Eliezer Dessler, and Rabbi Yehuda Segal zt"l (Manchester Rosh Yeshiva). The meeting decided to organise a much larger assembly of Rabbonim in London two months hence to properly formulate a constitution, which would formally establish the Kolel. It was at the first meeting that the Kolel ideal was nurtured and developed, it was the formal assembly of Rabbonim held at 46 Townsend Road, Chesham, Buckinghamshire, the wartime home of Rabbi Dessler, that the Kolel was actually born. The list of those present make fascinating reading and represented the leading Torah luminaries in England at the time. They were; Rabbi S J Rainbow (Chairman), Rabbi Elyah Lopian and Rabbi L Gurwicz of London, Rabbi Chaim Shmuel Lopian, and Reb Dovid Dryan of Gateshead, Rabbi Dessler, Rabbi S Moscowitch (Shotzer Rebbe) of London, Rabbi I Margulies (Premislaner Rebbe) and Rabbi Yisroel Ehrentreu of Chesham, Rabbi Yehuda Segal, Rabbi H Goldstein and Rabbi Kopul Rosen of Manchester, Rabbi Benjaminson (Zhlobiner Rav) of Letchworth, Rabbi M Cohen of Northampton, Rabbi Josselowitch, Rabbi G Schneider, Mr A Goldman of London, Mr A Weinkoff (father of Rabbi Aryeh Carmell) of Chesham and Mr H E Bloch of Gateshead. At this assembly the Constitution was drawn up and the aims of the Kolel were clearly enunciated. The Kolel opened its doors a month earlier on Rosh Chodesh Teves 5702 (November 1941), and amongst its first members were Rabbi M Schwab, Rabbi P Gard, Rabbi K Pinsky, Rabbi S Dancigas, Rabbi Ch S Lopian and Rabbi L Grosnass Zecher Tzadikkim L'Brocho. With dedication and single-mindedness they set about their learning and Rabbi Dessler in a letter to his friend, Dr Heiman describes in terms of superlative the depth and standard of their learning. Within a few months this small nucleus was joined by Rabbi E Konigshofer, Rabbi Z Waltner and Rabbi L Lopian. Although the Kolel had premises and a constitution, these things do not guarantee its existence or ensure its survival. It was the indefatigable efforts of Rabbi Dessler and Rabbi Shakovitzky who, together contributed the driving force, both spiritually and financially, to give the Kolel its initial momentum. Rabbi Dessler travelled the country to encourage people to support the Kolel, and it was he who gave an undertaking that the Kolel should not fall into debt and personally shouldered the financial responsibilities that the undertaking implied. His schedule in those early years was staggering by anyone’s standards. Two or three days midweek were devoted to giving Shiurim to his erstwhile Talmidim in London and places of evacuation, and this was his only source of income. He would travel through the night to arrive in Gateshead on Thursday. During his two or three days in Gateshead he involved himself in the affairs of the Kolel, delivered a profound Shiur to all the members of the Kehilla on Friday night (besides a Shiur to the Girls Seminary when it was established). His return to London was via Manchester where he gave a weekly Shiur. Bear in mind that it was wartime, that travel by train was arduous, that most of his travelling was done through the night, that in addition to his fixed heavy schedule, he travelled extensively to raise funds for the Kolel, that he was in his fifties and not a strong man – and that word “Mesirus Nefesh” takes on a new dimension. Slowly but surely, the Kolel consolidated its fledging status. The weekly expenses, average £65 in 1943 quickly rose commensurately with the student body. 22 Claremont Place was purchased and became the permanent home for the Kolel to this very day. The Kolel was advancing in other ways too – the June 1944 Council Meeting authorised the breaking through of two ground floor rooms at 22 Claremont Place “as the study rooms were rather tight at present”. Also the purchase of an electronic clock was sanctioned” The minutes of that meeting tell us that “The Hon. Secretary then suggested that an application be made to install a telephone, as this was proving more and more essential in view of the increased activities. The Council agreed. Rabbi Dessler was a leader who thought in terms of Klal Yisroel and did not limit his vistas to the single institution to which he was attached. He saw the Kolel as having a responsibility to actively assist other institutions, always for the good of Klal Yisroel and Yiddishkeit. Consequently, Rabbi L Lopian was encouraged to give a Shiur to a group of advanced students in the Gateshead Yeshiva and the famous Kibbutz Shiur which did so much to enhance the Yeshiva’s reputation both nationally and internationally, began. Rabbi M Schwab gave Shiurim on Hashkofah and Mussar in the Yeshiva and became its first Mashgiach Ruchni. With the establishment of the Seminary for Girls in 1944 by Mr A Kohn, Chavrei HaKolel were encouraged to give Shiurim there and in the same year, Rabbi M L Bamberger, a member of the Kolel was actively encouraged to become the first principal of the Boarding School for Boys. In 1948 with the Kolel firmly established and fully viable, Rabbi Dessler felt able to accept a call by his friend and associate, Rabbi Josef Kahanman to become the Mashgiach Ruchni of Ponevez Yeshiva in Bnei Brak. He did not relinquish his connection with the Kolel, but returned periodically to give of his wise counsel, as always thinking and working for its advancement and benefit. In day-to-day matters the Kolel was now presided over by Rabbi N Shakovitzky, and his unassuming manner, coupled with his towering scholarship commanded respect not dissimilar to that accorded to Rabbi Dessler. When Chazal say Megalgelin Zechus alyedey Zakay, that good things happen through good people, it is a maxim that would fittingly describe the establishment of the Kolel by such selfless sterling personalities. The same expression could be utilised in describing the type of people who have so ably worked for and assisted the Kolel in the era after Rabbi Dessler. 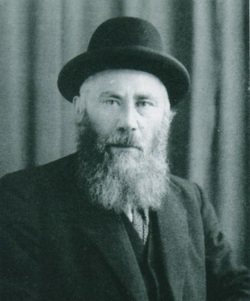 In 1947 Rabbi Dessler called upon the services of Rabbi Dovid Freilich zt"l who was then Rav in Dublin, to shoulder the ever-increasing responsibilities of raising funds for the Kolel. Rabbi Freilich accepted this position and for the next fifteen years worked indefatigably, combining dignity, nobility and a warm radiant personality in the fulfilment of his duties. Although he retired from those duties in 1962 (the financial responsibility henceforth being shouldered by the Chavrei HaKolel themselves) he was asked to spearhead the fund-raising for the rebuilding and refurbishing of 22 Claremont Place in time for the Silver Jubilee in 1966. This he did with usual aplomb, and on Wednesday 7th September 1966, 22nd Elul 5726, Rabbi Freilich was given the honour as Chairman of the Building Fund to officially open the new building. In the seventy five years of its existence, the Kolel ostensibly appears the same. Aesthetically perhaps somewhat changed – but essentially the Kolel functions as it always did. But what progress! A list of its illustrious graduates contains a roster of some hundred and fifty learders of contemporary Jewry. Dayonim, Rabbonim, Roshei Yeshivo, Magidei Shiur – people who are the towering leaders and inspirers of our age. Where would all these Gedolim have developed had the Kolel not existed? Quietly and unobtrusively the Kolel carries on its vital function, nurturing an ever-increasing number of Talmidei Chachomim – the lifeblood of Klal Yisroel – allowing them, through their own diligence and dedication, to flower into Gedolim of tomorrow’s generation. Now reflect upon wartime England in the early forties. In a small room in Gateshead, a close Chaburoh are sitting and learning. Brave men, pioneers, not knowing what the future held, or where it would take them. Whilst Europe was enslaved and expiring they realised their responsibility in re-kindling the flame of Torah afresh Ki Lo Tishochach Mipi Zar'o. Behind them you see Reb Dovid Dryan, Rabbi Dessler and Rabbi Shakovitzky, building, striving, working tirelessly for the Kolel, their eyes seeing into the future – planning for a future, Chochom Odif MiNovi working for Klal Yisroel for they knew that Hashem Yisborach would never abandon His people. In the merit of its noble founders the Kolel has been granted over 75 years of achievement. Let us hope that in their wonderful spirit and the merit of all who identify with the eternal People and its Torah, Hashem Yisborach should shower His blessings on the Kolel enabling it to continue its vital work – L'Hagdil Torah U'Lhaadiro.